Sofia, I’m finally here! Life is slowing a bit. Hi! 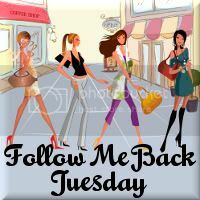 I am hopping over from Follow Me Back Tuesday to follow you. I’m following you now, thanks for following me. Thanks for stopping by my blog and for following! I’m following you back on twitter! Have a great week! Thanks for being my 200th follower! You should come back and enter the new follow giveaway, which has a new prize added for reaching 200 followers! Thanks for joining me at Create With Joy! I am already a follower of your awesome site! Hope you’ll visit me regularly so we can get to know one another better! Im following you back! 🙂 Thanks for visiting! Thanks for following my blog “Its All Random”. Following you back!! Hello~ I’m following you back from FMBT!